Open centre shelves and a propped-up stance on post-style legs give this 60-inch double vanity an airy look that will make any bathroom appear more spacious. The rich cinnamon finish promotes a warm, welcoming vibe that is sure to please homeowners and guests alike. Abundant storage options for powder room accessories and toiletries exist in the two double-door cabinets and full-extension upper centre drawer, all of which are fashioned with flat-panel craftsmanship for a clean, sleek look. Explore the Foremost Exhibit lineup for a complementing wall/floor cabinet and/or mirror in the same warm cinnamon finish to complete your bathroom setup. Reminiscent of handiwork forged during the Arts and Crafts movement of the late 19th century, this 30-inch vanity cabinet features rustic design elements and a gorgeous nutmeg finish to augment any bathroom. This piece is as functional as it is beautiful, providing ample storage for bathroom essentials with one large cabinet door and two right-side drawers. The detailed slats adorning the front of this vanity bespeak a craftsman-like touch, giving it a custom-built feel. Infuse a classic, elegant aesthetic in your master or guest bathroom with this transitional-style cabinet from the Foremost Knoxville collection. 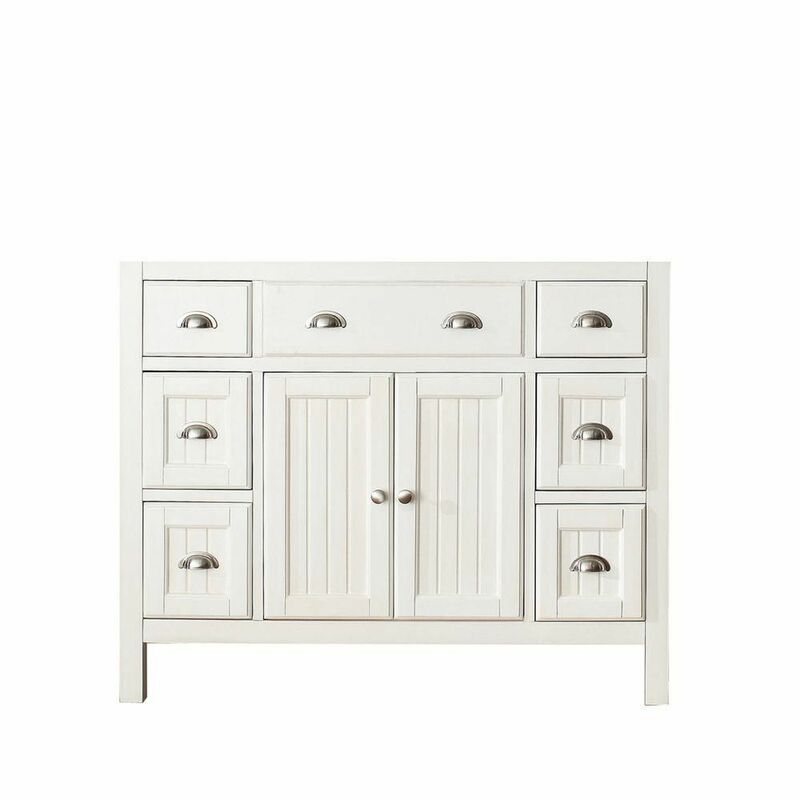 Hamilton 42-Inch Vanity Cabinet in French White We designed the Hamilton Collection for those who appreciate a stylish piece of furniture rooted in Americana design. The Hamilton 42-inch. vanity reflects a touch of Europe in its French White finish. Solid poplar construction and plenty of storage space make the Hamilton the practical choice for a wide range of bathroom styles. Match it with the natural beauty and durability of a stone top and you create the perfect vanity ensemble. Hamilton 42-Inch Vanity Cabinet in French White is rated 4.4 out of 5 by 11. Rated 1 out of 5 by Kathy from The Home Depot description said that it was constructed out... The Home Depot description said that it was constructed out of wood... The manufacturer’s website said that the “frame” was made from poplar wood, but that the outside panels were MDF! Not a very good material for use in a bathroom! I returned it and purchased one from a local cabinet maker. Rated 5 out of 5 by Tony from A beautiful piece of furniture. Looks great in our new... A beautiful piece of furniture. Looks great in our new remodeled bathroom. Rated 4 out of 5 by HomeDepotCustomer from It was very nice.... It was very nice. Rated 5 out of 5 by Rebekah from This look amazing in my bathroom. I love how... This look amazing in my bathroom. I love how the drawers shut. Rated 4 out of 5 by Jenny from Like the vanity very much. However, the French white... Like the vanity very much. However, the French white is actually beige. It doesn't go well with my white bathroom. Rated 5 out of 5 by DRMContracting from Love it, we were looking for something different for the entry bathroom and this fit our style. ... Love it, we were looking for something different for the entry bathroom and this fit our style. Right size, color, and price. We are finalizing our Hurricane Harvey rebuild and this is just one more piece to the puzzle. My only suggestion is inset legs so you will not have to cut slots in the floor trim moldings. But other than that, we love it. Rated 5 out of 5 by MB from We have almost finished a bathroom overhaul. I wasn't going to replace the vanity but in the end ... We have almost finished a bathroom overhaul. I wasn't going to replace the vanity but in the end did. I am so happy that I did, I am very pleased with the Hamilton. It looks beautiful and has 6 drawers and plenty of storage behind the doors for bathroom cleaning supplies and extra toilet paper and paper towels' French White is just a nice clean white that blended in with other white shelving that I already had. I love the Farmhouse look, it was a great addition to the bathroom, I am so glad I decided to get it.